Toggle lever clamps are used, for example, in machines tools, welding machines or special systems for ixing workpieces. Some high pressures act on the joint of the toggle lever clamp during movement. The toggle lever clamp absorbs the high tension forces directly, meaning that they do not stress the machine bench. Toggle lever clamps are also known as pneumatic clamps. The piston pin bed for the application was manufactured with maintenance-free plain bearing bushes made from KS PERMAGLIDE® P10. 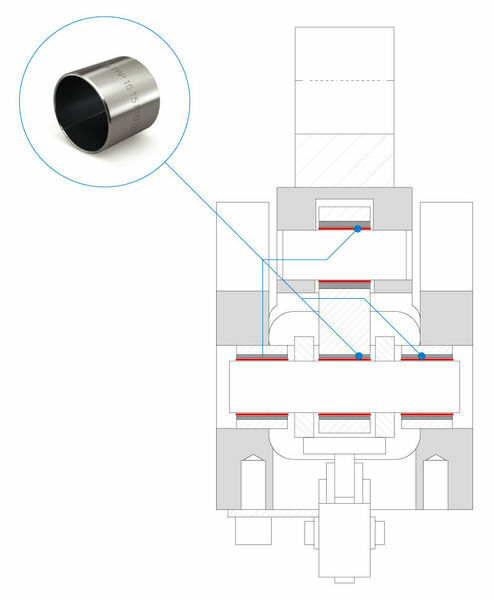 Advantage compared with plastic plain bearings: KS PERMAGLIDE® P10 plain bearing bushes can withstand high pressure. Plastic plain bearings, on the other hand, would tend towards cold low on the axes, resulting in a larger bearing clearance. Advantages compared with bronze bushes: KS PERMAGLIDE® P10 plain bearing bushes require no lubrication with grease or oil and have thinner walls than bronze bushes.